Are you ready to interact with Academics &Entrepreneurs? 11 Academics from National Sun Yat-sen University (NSYSU), Taiwan from the disciplines of Biological Science. Representatives from leading organizations in the Private sector, the Government sector and institutions. Masters & Ph.D. Scholarships at NSYSU. Interactive Brainstorming session to conceptualize and into the authentication of natural products and product development. Establishing Public-Private Partnerships linking industry and academia. 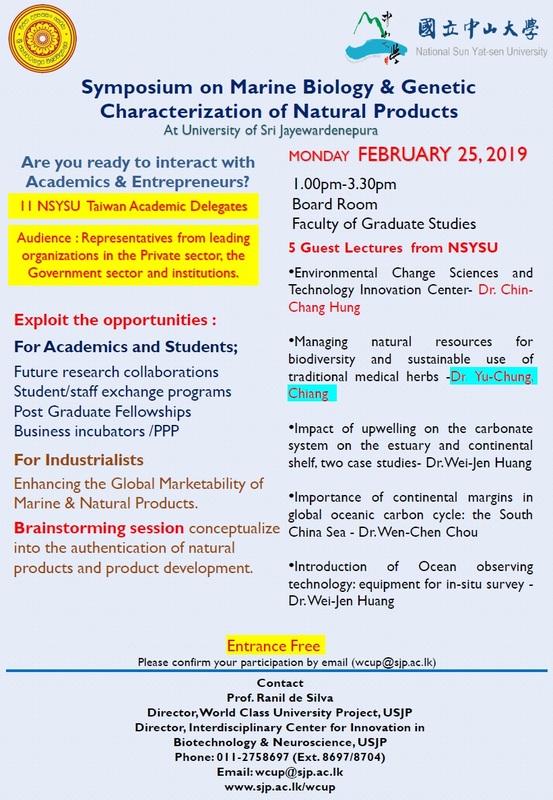 To complement the inauguration of the newly built “Environmental Change Sciences and Technology Innovation Center” (ECSTIC) at the Department of Zoology, Faculty of Applied Science, the World Class University Project, University of Sri Jayewardenepura, will be hosting a Symposium on “Marine Biology & Genetic Characterization of Natural Products” in collaboration with National Sun Yat-sen University, Taiwan (NSYSU) on the 25th February 2019. The center is a consequence of two MoUs signed between NSYSU and USJP implementing International split-joint collaborative research projects on both marine biology and natural product genetic characterization through student exchange programs funded through Taiwan’s Ministry of Science and Technology. Symposium on Marine Biology & Genetic Characterization of Natural Products. The symposium is organized to bridge the gap between industry and academia propelling towards product development and genetic characterization of natural products intend to protect our own herbarium with dignity.